If you want to catch lunch or dinner or wish to take your catch home with you then this is the place for you. We have ponds of varying difficulty and fish between 400g and 6kg in size. Please note all fish caught must be kept and payed for because throwing them back will cause them to stress and die. We can supply all the fishing gear you need, rods, bait, buckets, nets and friendly assistance or you can bring your own fishing gear and we can help to rig it up for you. Catch a fish in the touch tanks. 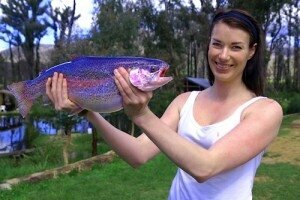 We stock tanks with small rainbow trout and visitors of all ages can try to catch a fish with their hands. Kids can spend hours trying to catch the fish which are quick and slippery and it’s fun for everyone. Feed the fish and watch the feeding frenzy. Visitors will receive a special mix of fish food that is used to grow our fish and directed to selected ponds. The fish are always hungry and jump out of the water in a mad dash for the food. A container of fish feed is free to all visitors. There are numerous picnic shelters and BBQ areas around the ponds for visitors to relax and have lunch. It's a great way to spend the afternoon. Bring along some salads, bread, plates and drinks and cook your fish on the BBQ. For a small fee we will even prepare your fish with herbs, spices and foil ready for cooking. Bring along some chops and snags for those who don't like eating fish. Alcohol may be brought if kept in moderation. On weekends and public holidays it is wise to book a picnic shelter so you don't miss out. 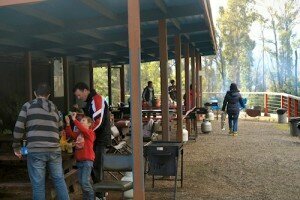 Picnic Shelters and gas bbq’s are free. For those who don’t have the time or don’t want to fish we have fresh fish and smoked product available.